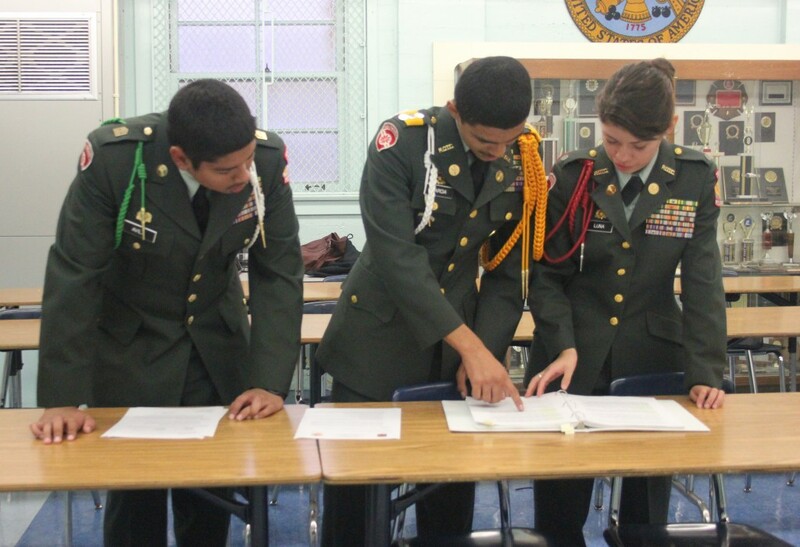 The JROTC Sheik Battalion had their annual DAI evaluation on Nov. 2, 2012. After three months of continuous practice, the cadets arrived at school early that morning to prepare for the arrival of the Director of Army Instruction Lieutenant Colonel Ted McDonald. All the cadets that participated were a new generation of members and they experienced a real DAI evaluation for the first time. They were inspected on the information they had learned during their short time in the program, how organized they were as a whole, and what they knew about their positions and ranks in JROTC. The battalion earned a total of 1,087 points out of a possible 1,100, their best score since 2009. “The administrators were very supportive, and the cadets did an outstanding job. The inspection went really well. I couldn’t be any prouder of my JROTC staff,” said MSG Harris about the evaluation. The next day, the Color Guard competition was hosted by JROTC and they were the third group to participate. “ We’re hoping for a top 5 finish,” said Executive Officer Second Lieutenant Estefani Luna.